Dodgers Blue Heaven: Blog Kiosk: 1/22/2016 - Dodgers Links - Verdugo, Urias and Buy your FanFest Autograph Vouchers Today! Blog Kiosk: 1/22/2016 - Dodgers Links - Verdugo, Urias and Buy your FanFest Autograph Vouchers Today! 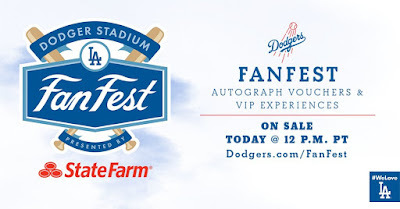 Get your Dodgers FanFest autograph voucher tickets today. Go here for information. All proceeds benefit the Los Angeles Dodgers Foundation. Go here to see my blog post about the sale from last night. FYI, Trade Deadline has been moved to August 1st for only this year, via Tom Singer at MLB.com. Via David Hood at True Blue LA, "Dodgers top prospects 2016: No. 8, Alex Verdugo." Verdugo has some of the best bat speed in the system, though this can be inconsistent. The obvious change from his high school days to 2015 is the fluidity in his swing. Verdugo has quieted his set up, with low hands and a slightly open stance, and employs a toe tap for timing. Verdugo’s swing is extremely short to the ball, and when right, he shows a high finish and extension, spraying line drives gap to gap. Via Ken Gurnick and David Venn at MLB.com, "High expectations only make Urias work harder." "The truth is, I'm proud that they've given me that high praise," Urias said in New York. "It gives me strength to keep working, work harder and achieve the goal I have in my mind." Via August Fagerstrom at FanGraphs, "The Worst Clayton Kershaw Pitches of 2015." Kershaw also mouthed off a bit on twitter at the mention of that new 9th planet. Via Mike Bertha at Cut4, "Why Clayton Kershaw really is out of this world." Via Ronald Blum at the AP, "MLB unsure of timing in Chapman, Puig and Reyes probes." "I would love to have these resolved before we begin play again," Manfred said. "The one thing I've learned about these cases is timing is not mine, right? You have to really rely on the criminal process playing out in order to put yourself in a position that you're comfortable to actually know what the facts are." Just played Legend of Zelda for 2 hours. This is the life I dreamed of 25 years ago. Stay in school, dreams come true kids. A Reddit user named r/dallenhill shared a fantastic pic of a sample promo-give away that was proposed one year. It's a Dodger sombrero. Check out a pic in the thread here. Via Samy's Camera, "Interview: Jon SooHoo – Los Angeles Dodgers Official Team Photographer." Q: What was the first Dodgers game you photographed? A: Back in the day, when I was a student at USC in 1981, the Trojans traveled to Dodger Stadium to play an exhibition game against the assembled Dodgers. One of the pitchers for the Dodgers was a young and upcoming left hander from Mexico. Who, during this exhibition, was just another pitcher among the four Dodgers to pitch that game. It took me about 20 years to go back through my negatives to realize that this was the beginning of Fernandomania.